In recent years we have begun to offer Pine Yurt frames with straight roof poles that are quick and easy to install and transport. These Yurts combine modern specifications with our trademark attention to detail and rustic charm. Hearthworks Pine Yurts have the straight roof poles characterised by the Mongolian Gers. We originally developed our straight roof Pine Yurts for our own hire range, seeing the need for a robust wooden framed Yurt that was easily and quickly erected, and able to be easily standardised. We saw the practicality in having replaceable interchangeable components and utilising the best in modern manufacturing techniques, to produce Yurts inspired partially by the Yurts designed and pioneered over the last 40 years in the United States. The wood we use to manufacture these Yurts is sustainably sourced Southern Yellow Pine or Douglas Fir, both of which are good types of softwood for construction purposes. The wood is finished with protective Yacht Varnish to prolong its life. Unlike the Ash or Kyrgyz Willow Yurts, the roof poles of the Pine Yurts are not steam-bent and are not lashed onto the trellis. Rather they are fixed onto the webbing tension band. 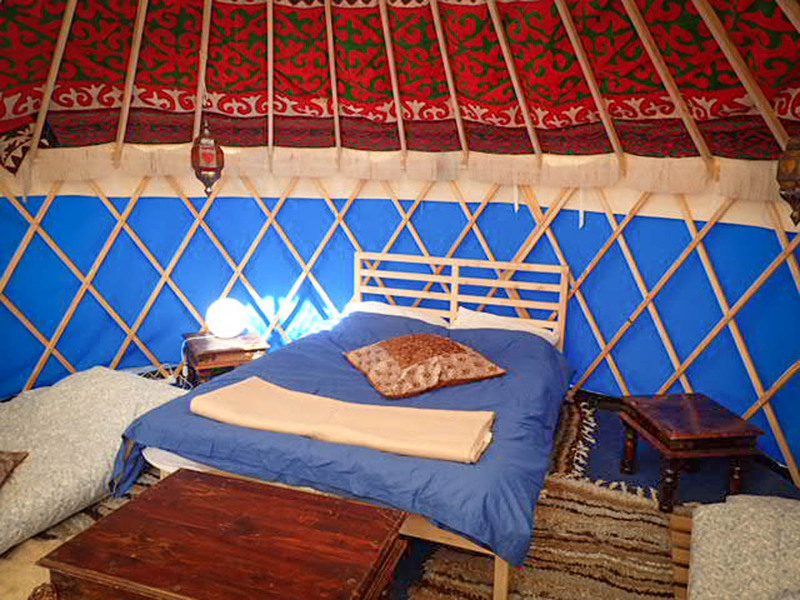 The straight roof pole design means that the roof poles are less likely to twist and makes the Yurt generally more sturdy. The trellis walls of the Pine Yurts are also from straight wood that is not steam-bent and the angle of the trellis wood is more upright, creating sharper diamond shapes in the lattice design. This makes the walls naturally taller and avoids them being concave. We still use the same steam-bent roof-wheel for the Pine Yurts, with it’s coppiced hazel bracing it gives even these straight-roofed Yurts a handcrafted rustic touch. We have refined and improved our Yurt cover design over many years. The unique design features and use of the best materials we can find, maximise practicality whilst maintaining the profound aesthetics of these beautiful structures. Our covers are expertly produced in our Sewing room, under the supervision of our Production Manager Rico Aalst, who has been sewing tents professionally for over 18 years. 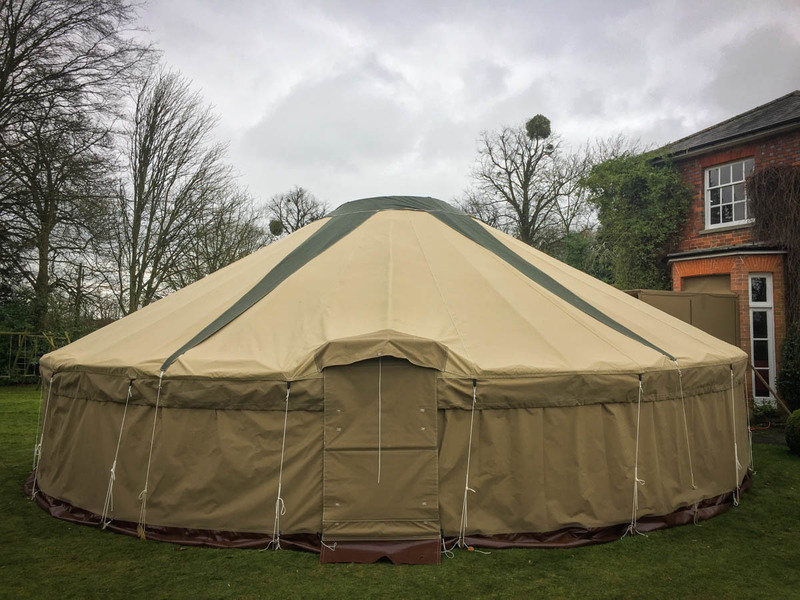 We can produce Yurt canvas covers from a tasteful pallet of colours and generally use Polycotton fabric, as we have found this to have a longer life than pure cotton canvas with the same treatment. We currently recommend the highest quality 12 oz yd2 Polycotton from British Millerain, which is proofed against Fire, Water and Rot, to British Standards. Bespoke canvas work, such as appliqued designs, is available by special request. The main canvas is often natural white to allow for maximum light penetration. Recently Sand colour has become more opular, due to its durability and superior aesthetic performance over time. We offer a choice of coloured trims at no extra charge, including Olive Green, Tan, Marine Blue, Dark Brown and Burgundy. The trim usually consists of the crown cover and the encircling valance at the bottom of the roof, though sometimes people also like to extend the colour to include either the whole wall or the whole roof. There are numerous additional features to Hearthworks Yurt covers, such as quick release point fastenings around the doorway, extra strength tension bands reinforced with webbing, additional storm loops for extra pegs, and numerous areas of double reinforced canvas eliminating any stress points. Hearthworks Yurt covers are built to last. Fitted canvas roof cover with reinforced double valance around the edge in between which the walls attach. The outer valance also has a draw cord at the bottom to keep it tight against the wall. Peg loops from polyester webbing with pre-stretched polyester cord and Ash pegs. Wall sections from canvas with spot fasteners on the door, and a PVC strip around the bottom section that sits on the ground. Star-shaped Roof Wheel cover from double thickness canvas with clear vinyl central skylight window. We have a range of extra options to suit your requirements including hardwood locking doors and windows in the side wall. All our Yurts are available with options of felt insulation, inner covers, wood burning stoves and platform floors. All of our Yurts come with a removable transparent PVC window over the crown wheel, so you always have a skylight. It is also possible to add clear PVC windows that are sewn into the wall. 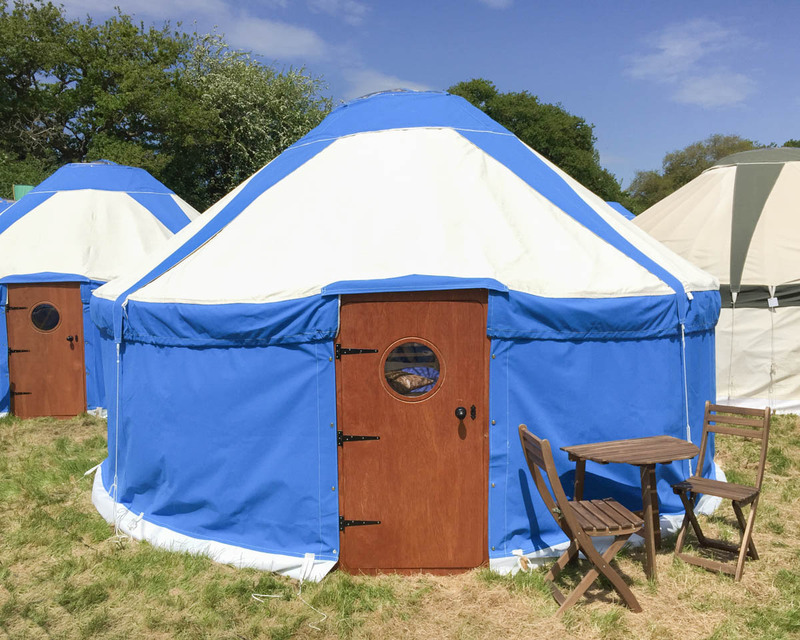 Our Yurt windows are rectangular in shape and come complete with a roll down canvas curtain on the exterior of the Yurt, velcro fastenings and ties. All our Yurts come with one entrance way and a canvas door as standard. For additional cost, you can change to wider width doorways (for example, to accommodate wheelchair access) or add additional doorways, or change a canvas door for a lockable wooden one. Our Wooden Doors are made from solid hardwood planks joined in a traditional ledged and braced cottage style. Each door is split vertically down the middle, as we find that sharing the load of the door with hinges on both sides helps to reduce the incidence of distortion over time. Doors can also be either standard width or extra wide wheelchair width. It is possible to add on an awning for over your door. This can be in the colour of your choice, and can also be added to your Yurt later. The awning makes it much more pleasant when coming or going in the rain, and adds an extra layer of weather protection to the Yurt over the door, which is the most likely area for water ingress issues to develop. Bear in mind, though, if you are in a very windy location, an awning may not be a good option for you. Similarly, it is best to take an awning down (or to remove the poles and secure it against the body of the Yurt) if you will be leaving your Yurt unattended for a length of time or if you are expecting a storm.